Flesh eating bacteria are very rare, or rather the condition in which bacteria destroy flesh is very rare. The medical term for this is necrotizing fasciitis and it is actually caused by a common bacterium – Streptococcus pyogenes. In special circumstances, this bacterium sets up a skin infection that becomes very severe. S. pyogenes infiltrates the skin's surface and starts to infect the tissues underneath. The layers of fat and muscle there become infected and start to die as the bacteria multiply and produce deadly toxins. About a third of people who develop necrotizing fasciitis never recover. Streptococcus pyogenes is a pathogenic bacterium but it usually causes infections that are fairly mild and self limiting or that can be easily treated with antibiotics. However, some people are not able to control S. pyogenes infection. These include any people who have a poorly functioning immune system, such as transplant patients on drugs to suppress their immune system, or cancer patients whose immune system is compromised by their cancer. Necrotizing fasciitis can also occur in people who have kidney problems, liver disease or diabetes, or who have just had chicken pox. If such a person has a cut or wound from an operation, the conditions are created that allow Streptococcus pyogenes to cause an uncontrollable infection. The cut where the infection begins becomes much worse and is intense, totally out of proportion to the size of the original injury. The most frightening thing about necrotizing fasciitis is the speed with which it develops. Within hours, the person also develops severe fever with shivering, sickness and diarrhoea. 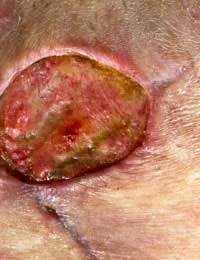 The other distinctive sign is that a large area of skin around the original wound becomes very red, hot and swollen. For most people, this is the first sign that something is very wrong and it is only at this point that they go to see a doctor or get to hospital. However, by this stage the infection has become quite advanced and then spreads through entire limbs or throughout the body within hours. When a large area of muscle and underlying tissue becomes infected, the toxins released locally cause the tissue to die, a process known as necrosis (hence the name necrotizing). When tissue dies on a living body this is known as gangrene, and becomes very difficult to control and cure. Disfigurement is inevitable. How is Necrotizing Fasciitis Treated? One of the first things that doctors need to do is establish how far the infection has spread, which they do with MRI or CT scans. Surgery is often necessary to stop the infection continuing to infect more tissue, as gangrene starts to set in. This is in addition to massive doses of antibiotics and intensive care for the toxic shock syndrome that develops as a result of the bacterial toxins travelling through the blood. Awareness of necrotizing fasciitis and flesh eating bacteria has risen during the last few years, causing great anxiety. One of the main reasons for this is that the dramatic nature of the condition makes it quite newsworthy. Tabloid newspaper headlines have reported bacteria eating people's faces and arms. This is not very responsible reporting, or very sensitive, but it should not cause readers to lose a sense of proportion. Fortunately, the circumstances that allow necrotizing fasciitis to develop are very rare and it is highly unlikely that anyone will develop this condition during their life, or even know someone who has had it.